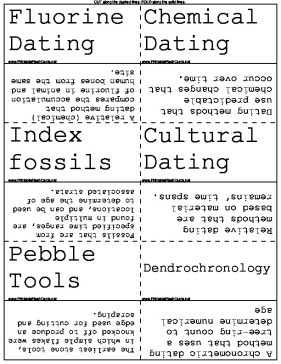 Methods of dating minerals and materials can be used to determine their age. Fluorine Dating A relative (chemical) dating method that compares the accumulation of fluorine in animal and human bones from the same site. Chemical Dating Dating methods that use predictable chemical changes that occur over time. Index fossils Fossils that are from specified time ranges, are found in multiple locations, and can be used to determine the age of associated strata. Cultural Dating Relative dating methods that are based on material remains' time spans. Pebble Tools The earliest stone tools, in which simple flakes were knocked off to produce an edge used for cutting and scraping. Radiocarbon Dating The radiometric dating method in which the ratio of 14C to 12C is measured to provide an absolute date for a material younger than 50,000 years. Isotopes Two or more forms of a chemical element that vary in the number of neutrons in the nucleus and by the atomic mass. Half-Life The time it takes for half of the radioisotopes in a substance to decay; used in various radiometric dating methods. Igneous Rock formed from the crystallization of molten magma, which contains the radioisotope 40K; used in potassium-argon dating. Radiopotassium Dating The radiometric dating method in which the ratio of 40K to 40Ar is measured to provide an absolute date for a material older than 200,000 years.